A Welsh Assembly Member has hit out at plans by Trinity Mirror to change the way journalists work, which will see a number of job losses made. The publisher launched its ‘Connected Newsroom’ proposals earlier this week which aim to build on its ‘digital first’ strategy with the introduction of individual and team audience goals. But Plaid Cymru AM Simon Thomas, pictured left, has slammed the plans and said he has ‘serious concerns’ that they will reduce the quality of journalism at Media Wales, echoing concerns already made by the National Union of Journalists. Four jobs are expected to be lost at Trinity Mirror’s Wales division, which includes the South Wales Echo, the Western Mail and Wales on Sunday, along with ‘a handful’ of redundancies at its Manchester and Huddersfield titles. 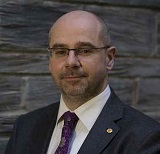 Mr Thomas, who represents Mid and West Wales, said Plaid Cymru was ‘extremely concerned’ by the implications of setting individual ‘click targets’ for journalists. He said: “The diktat coming out of the Canary Wharf headquarters of Trinity Mirror is aimed at boosting the website clicks at Wales Online, yet it is once again cutting the workforce at Wales’s largest newspaper centre. Mr Thomas warned that the changes could lead to a situation where investigative journalism was abandoned as reporters were forced to race for website clicks. He added: “I have serious concerns that this proposed new focus will lead to a reduction in the quality of local journalism. “Holding public bodies like the National Assembly for Wales and local authorities to account is vital for local democracy, so nothing must be done to diminish the important role journalists’ play. “I want an assurance from Trinity Mirror that there will be no attempt to undermine quality journalism at Media Wales. Trinity Mirror’s plans include using audience data to switch resources from the least popular to the most popular content. The publisher also wants to introduce individual and team audience goals to ensure journalists are ‘working on the right stories at the right pace’. Trinity Mirror has not yet responded to the comments by Mr Thomas. ‘Plaid Cymru attacks . . .’ It’s one member,not the whole party. Plaid does love to spin the English-based company side of things. How about coming up with a sensible idea for the future of the media in Wales that doesn’t involve throwing millions at a shrinking language and irrelevant TV channel?